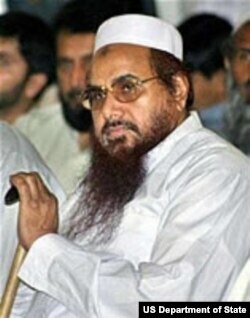 Hafiz Mohammad Saeed is the founder of the Lashkar-e-Tayyiba terrorist group and is wanted for helping plan a 2008 attack in Mumbai, India, in which 166 people, including six American citizens, were killed. A native of Punjab Province in Pakistan, Saeed is 61 years old, has brown eyes, red hair and a beard. Held under house arrest when the Lashkar-e-Tayyiba, or LeT, was banned by the Pakistani government, he was released in 2009 and now resides in Lahore. He travels widely spreading an ideology that advocates terrorism, as well as virulent rhetoric condemning the United States, India, Israel and other perceived enemies. These attitudes were put into action in November 2008, when 10 LeT trained gunmen conducted a three-day rampage in Mumbai which included attacks on two hotels, a Jewish center and a train station. In December 2008, a United Nations committees listed Saeed as an individual associated with the al-Qaeda terrorist organization and subject to international sanctions. The U.S. Rewards for Justice Program is offering a reward of up to ten million dollars for information leading to Saeed’s arrest or conviction.